Having been a visitor to the RyPN discussion forum since its inception-and reader of the Locomotive & Railway Preservation magazine previously-I have always been fascinated by the diversity of opinions relating to rail preservation subjects. One of the more controversial areas seems to be the particulars of what constitutes a &apos;good&apos; equipment restoration? While I have made my own feelings known within a given thread dealing with a specific subject, the limitations of the format often prevent the development of a cohesive answer to the inquiry. For example, if someone asks the question &apos;how does one adjust fuel injectors on a 12-567&apos;, the answer can usually be formulated in a straightforward fashion-not subject to interpretation. In the case of inquiries such as (a hypothetical example) "why did your group change out the entire brake system on the E-8," the answer is often much less than straightforward. Over time, I have begun to believe that this type of discourse must evolve within some of sort of meaningful context. NYNH&H No. 0401, as was on November 4, 2001.� Photo by Dave Kay. So, I thought it might be worthwhile to document the thought process that enabled development of the final &apos;restoration specification&apos; for a specific piece of equipment. In this case, I am speaking of the former NYNH&H Alco-GE FA-1 0401. By the time this item was acquired by the Railroad Museum of New England in 1986, the 0401 had been modified in such a fashion that it was actually no longer a locomotive. This fact alone would create a number of significant challenges that would have to be surmounted before restoration could begin. One of the things that the reader should keep in mind is that I am making no overarching statements about what is &apos;right&apos; or &apos;wrong&apos; relative to the subject of restoration. My hypothesis is that the shape and form of the restoration must be driven by a) the owning group's mission, collections management policy and resources and b) what the artifact &apos;tells&apos; you. This second point will be explained in due course. Once the locomotive was on museum property, the first task was to do some basic research in order to develop a timeline as to how the locomotive physically evolved during its service life. Based upon the existence of available books, magazines and various photo collections, it was simple to ascertain the evolution of paint schemes and external details. The next task, which proved to be far more daunting, was to develop a time line detailing the evolution of mechanical/electrical/air systems. For the purposes of this discussion, I am going to refer to those systems as the "mechanism." Again, based upon readily available research materials, we were able to establish that there were three distinct iterations of the mechanism: a) 1947 (as-built), b) 1959 (as done by Alco under their FRS moniker) and c) 1974 (the conversion from locomotive to power car). So, we began to assemble technical documentation relating to the &apos;as-built&apos; configuration. To this end, we were able to mine the museum archives and assemble a number of different operating manuals and maintenance manuals for the FA-1 locomotive. One of the operators&apos; manuals was actually produced by the railroad itself. With all of this material, it was still not possible to absolutely ID the model number of say, the traction generator, in the as-built version of the locomotive. At this point, we were also bereft of a parts book, which would have answered at least some of these questions. 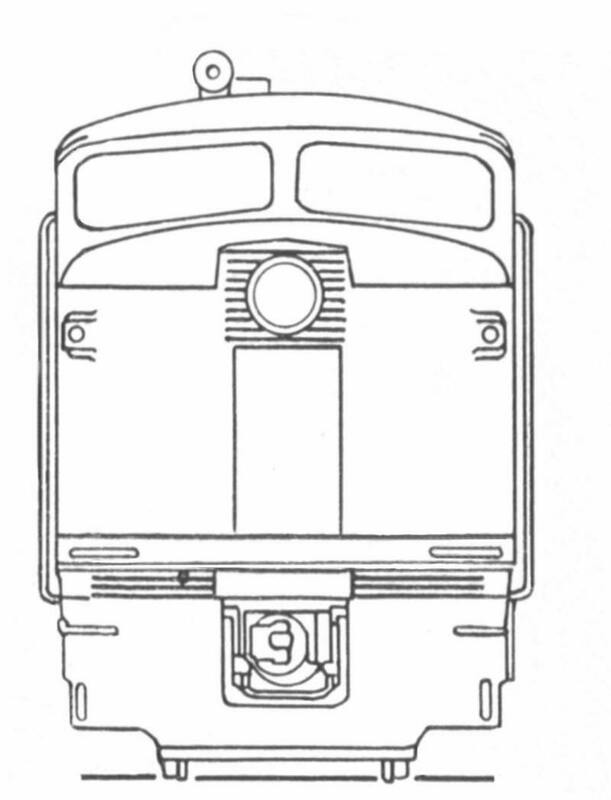 Line art from the Alco/GE Operating Manual for the locomotive, Publication # 1500RO dated 5/47. Another item that turned up in the archives was a set of NH RR diesel locomotive painting diagrams covering the various incarnations of the 0401. The existence of this material can be attributed to the pioneering efforts of the New Haven Railroad Historical and Technical Society (NHRHTA). NHRHTA had been able to save a large volume of paper material from the NH RR&apos;s general office building in New Haven, CT. Although much of the material was in &apos;deep storage&apos; and had not been professionally catalogued, NHRHTA did manage to reproduce and publish certain items. There was also a well-researched two-part article on the NH 0400 locomotives in the group's magazine, The Shoreliner. The next avenue pursued was builder's photos. It was determined that the 0401 was constructed under the same S.O. (shop order) number (S.O. 3030) as a series of UP FA-1 locomotives. By way of explanation, the Shop Order was a number assigned to a group of locomotives by Alco long before actual construction. This was done for the purposes of production planning, so that long lead outside-purchased items such as the electric transmission (supplied by General Electric) could be purchased, manufactured and shipped to the Alco plant in a timely fashion. It could be inferred that locomotives with the same S.O. had been constructed with identical pieces of major equipment. An inquiry was made to Alco Historic Photos, and we were able to source a number of views of the interior of a UP FA-1 that carried the same S.O. number. We now had good photographic coverage of such areas as the nose cab, operators&apos; cab, and contactor cabinet and engine room. From the onset of the project, I began to contact folks by mail that had first-hand experience with the 0401 during its tenure on the NH RR. While their memories of events some forty years previous was a bit tenuous, it was confirmed that all of the records pertaining to the 0401 and sister locomotives had been purged from the New Haven Diesel Shop files. This event occurred during the days of Penn Central ownership. As the shop was now owned by yet another party (Amtrak), I thought there was little hope of ever securing the required information. In a strange twist of fate, a search through a box of donated NH diesel locomotive material from the museum archives yielded a tattered-but serviceable schematic diagram for the 0401. Now, we could finally pin down a good deal of information relating to the electrical equipment present in the as-built locomotive. The final item that would have been useful to have was the Alco &apos;Report of Shipment.&apos; This document actually detailed the manufacturer, model number and serial number of almost every significant item located within the locomotive-including mechanical, electrical and air items. To date, the search for this document has been fruitless. Analysis of the schematic, or &apos;print&apos;, indicated the item was an &apos;early&apos; copy supplied by the factory to the customer. To explain further, the locomotive schematic diagram is an item that tends to evolve over time. In the early days of diesel locomotive operation, it was not uncommon for the builder to make changes in electrical devices and/or circuitry-based upon the &apos;behavior&apos; of locomotives in the field. This could be done either during the warranty period or later on, based upon the analysis of an operational/service issue by the builders&apos; representative. In either case, feedback to the factory might result in an updated schematic. Consequently, the ultimate value of the &apos;print&apos; to the restoration process had yet to be determined. Nonetheless, the schematic diagram did yield some very important information-which was a list of &apos;related diagrams.&apos; Some of the diagrams served as the actual blueprint for performing the task of wiring the locomotive. In 1947, GE supplied the &apos;physical wiring diagrams&apos; for the contents of the high voltage cabinet (contactor cabinet in Alco parlance). In turn, Alco created the wiring diagram for what they called the &apos;chassis&apos;-or carbody. The balance of the diagrams detailed internal wiring of discrete components and/or &apos;panels&apos; as supplied by GE. As fate would have it-copies of these diagrams would ultimately prove to be unavailable. One of the successor companies to Alco moved all the remaining Alco drawing files to their Montreal plant due to plant consolidation. Not long after that, the successor company sold the remnants of the Alco locomotive business to GE-Canada, who in turn disposed of the business by re-selling it to an American company. It was rumored, albeit unconfirmed, that GE Canada disposed of all drawings that supported Alco 539 or 244 engined locomotives. A concurrent inquiry to GETS at Erie also came up empty. So, at this point, we can consider the search for technical documentation of the &apos;as-built&apos; locomotive to be complete. Our next task was to assemble technical documentation relating to of the second, or FRS, configuration. FRS, or Factory Rebuild Service, was a program that Alco developed to address customer requirements for factory overhauled/upgraded locomotives. The secondary goal was of course, to bring more business into the plant. To date, I have found no documentation in any shape or form that would detail the breadth and scope of the work performed on the 0401 back in 1959. The reasons are documented within the previous paragraph. The final task relating to documentation pertains to the third, or power car configuration. Eventually, a sympathetic shop foreman in the LIRR diesel shop was kind enough to send a copy of the power car schematic diagram, along with some other material. At this point, we decided to consider the search for supporting documentation complete. The next order of business was to examine the 0401 within the context of the RMNE collection. For those who don&apos;t know, the RMNE diesel locomotive collection is made up of locomotives that operated within the New England region. Mainline, shortline, regional and industrial units are all included. More line art from the Alco-GE 1500RO publication. The 0401 is significant on several fronts. It was part of the first NH A-B-A set of FA-1s, and the only survivor of that set. It is the last NH FA-1 carbody that is &apos;intact&apos;, given that the other remaining example was gutted of almost all original interior fittings by the LIRR, and has had extensive external changes and modifications, also by the LIRR. It is the only example of an early streamlined road freight locomotive in the RMNE collection. As it happens, the RMNE diesel collection is very heavy on lasts; the last FL-9 (and last F unit) ever built, the last extant MEC RS-3, the last extant NH RS-3 and the last CR U23B (and last U-series) ever built. Therefore, I think it can be argued that the 0401 can be viewed as either significant in its own right-or a meaningful part of a significant collection. Finally, I decided to examine the ranks of other preserved/restored FA-1s in North America. My theory was that the number and quality of existing restorations would help to place some of our decisions pertaining to the path of our work in a different light. The search for other FA-1s was simple; there was only one other example that had been preserved and restored. This is the CN 9400, which was the first CN FA-1 and the first FA-1 sold in Canada. Two museum members made the journey to the Canadian Railway Museum at Delson, Quebec in order to extensively photograph the unit (particularly the interior of the body and cab) and take some detailed measurements. Analysis of the photographs revealed an interesting fact; a very good percentage of the CN 9400&apos;s original fabric was intact. The only exception taken was the nose, as the locomotive was known to have been wrecked in service. The nose was obviously salvaged from a later FA-2 variant. Further comparison with the photos obtained from Alco Historic Photos showed that many pieces of internal equipment appeared to be identical. The fact that there was an actual example of a &apos;complete&apos; FA-1 available that could be used for &apos;reference&apos; was a significant breakthrough.